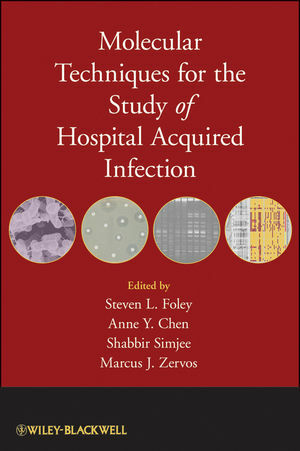 Providing a broad overview of the microbial pathogens associated with hospital-acquired human illness, Techniques for the Study of Hospital Acquired Infection examines the cost-effective use of laboratory techniques in nosocomial infectious disease epidemiology and control. This concise guide addresses the cost benefits of combining modern molecular techniques with the traditional activities of infection control departments. The book is useful as a guide to hospital infection control programs as well as a text for medical practitioners, grad/medical students, researcher scientists, population biologists, molecular biologists, and microbiologists. Shabbir Simjee, Ph.D. is a Senior Microbiologist at Eli Lilly & Company, where he specializes in antimicrobial susceptibility testing and the interpretation of antimicrobial susceptibility data according to NCCLS and BSAC standards. He has served as Editor of The Journal of Antimicrobial Chemotherapy and currently serves as an Editorial Board Member for Antimicrobial Agents and Chemotherapy as well as Section Editor (Molecular Microbiology) for the International Journal of Antimicrobial Agents. Dr. Simjee has served on a number of FDA advisory committees. Steven Foley, Ph.D. is an Associate Research Scientist for the National Farm Medicine Center, Marshfield Clinic Research Foundation, as well as Clinical Professor of Clinical Microbiology at the University of Wisconsin. His research interests include understanding the mechanisms that Escherichia coli employ to resist being killed by vertebrate immune system constituents and the development and utilization of genotypic and phenotypic methods to track enteric bacterial pathogens and their virulence and antimicrobial resistance factors through the food animal production environment. Anne Chen, M.D. is a Senior Staff Physician, Division of Infectious Diseases at the Henry Ford Hospital, Detroit, Michigan as well as Assistant Professor of Medicine at Wayne State University School of Medicine. She is Board Certified in Internal Medicine and Infectious Disease and is currently researching Candida epidemiology in the burn unit. Marcus J. Zervos, M.D. is the Medical Director of Infection Control and Division Head of Infectious Disease, Department of Internal Medicine at Henry Ford Hospital as well as Clinical Professor of Medicine in the Department of Internal Medicine, Infectious Diseases Section at Wayne State University School of Medicine. He chairs the Infection Control Committee at the Henry Ford Hospital and is certified by the American Board of Internal Medicine and Infectious Diseases. Dr. Zervos serves on the boards of several journals in infectious disease, microbiology and internal medicine, including Infectious Diseases in Clinical Practice and his role as Section Editor for the journal Infection Control and Hospital Epidemiology. I. Introduction to Healthcare Associated Infections and Their Control. 1. The Hospital and Ambulatory Care Environment (Anne Y. Chen and Hiren Pokharma). 2. Pathogen Transmission in the Healthcare Setting (Sonja Hansen and Ralf-Peter Vonberg). 3. Infection Control Basics (Louise-Marie Dembry and Carlos Torres-Viera). 4. Cost-Effectiveness of IC Program (Marc-Oliver Wright and Eli N. Perencevich). 5. Outbreak Investigations (Importance of the Healthcare Epidemiologist) (Marcus J. Zervos). 6. Pathogen Elimination: Antibiotic and Disinfectant Use and the Development of Resistance (Steven L. Foley, Beilei Ge, Carl M. Schroeder, and Arron M. Lynne). II. Techniques to Characterize Nosocomial Pathogens. 7. Rapid PCR Screening Methods (Ngolela Esther Babady, Frankling Cockerill and Robin Patel). 8. Restriction Analysis Techniques (Richard V. Goering, Mary Stemper, SanjayShukla and Steven Foley). 9. Pulsed-field Gel Electrophoresis (Mary Stemper, Steven Foley Richard V. Goering, and Sanjay Shukla). III. Application of Techniques to Characterize Predominant Nosocomial Pathogens. 10. Staphylococcus aureus (Vanthida Huang). 11. Escherichia coli (Johann D. D. Pitout). 12. Fungal Infections (Jose A. Vazquez).